Despite the objection expressed by Native Americans, of the use of sacred names from their history and culture as nicknames and mascots for team sports, most Americans still support the use of names like “Redskins,” according to a recent poll conducted by the Associated Press. Although 79 percent favor keeping the name, that does represent a 10 percentage point drop from the last national poll on the subject, conducted in 1992 by The Washington Post and ABC News just before the team won its most recent Super Bowl. The AP-GfK poll was conducted from April 11-15. It included interviews with 1,004 adults on both landlines and cell phones. It has a margin of sampling error of plus or minus 3.9 percentage points. "With everything that Native Americans have gone through in this country, to have a sports team named the Redskins - come on, now. It's bad," said Pamela Rogal, 56, a writer from Boston. "Much farther down the road, we're going to look back on this and say, 'Are you serious? 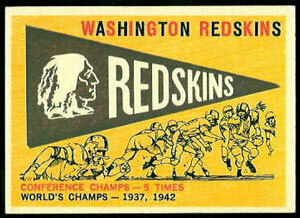 Did they really call them the Washington Redskins?' It's a no-brainer." Among football fans, 11 percent said the name should be changed - the same as among non-fans. Among nonwhite football fans, 18 percent said it should change, about double the percentage of white football fans who oppose the name. A Redskins spokesman declined to comment on the poll's findings or to make team executives available for interviews. In Washington, debate over the name increased in recent months. In February, the National Museum of the American Indian held a daylong symposium on the use of Indian mascots by sports teams. Museum Director Kevin Gover, of the Pawnee Nation, said the word "redskin" was "the equivalent of the n-word." Synder, however, has been adamant that the name should not change, and NFL Commissioner Roger Goodell said he supports the team's stance. 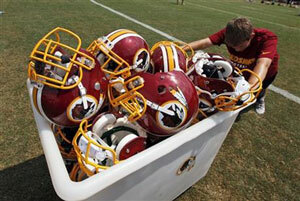 General Manager Bruce Allen said in March that the team isn't considering a new name. AP Sports Writer Joseph White, AP Director of Polling Jennifer Agiesta and News Survey Specialist Dennis Junius contributed to this report.